This Post and Beam two bedroom + loft is a favorite place to stay on the Point. Private with deep water swimming a perfect get away for two to five people. You can relax in the all day sun or lounge in the shadows to read your book. The sunrises are incredible and the evenings are beautiful with sunsets through the whole summer. Star gazing is unsurpassed as the north shore of the bay has few cottage lights to obscure the stars. This Boathouse is cozy but full of natural light. the lapping of the water is a sleep aid that no drug can compare to. A hideaway with fantastic convenience to everything in Muskoka. Easy to get to. This property has been in our family since the early 1900's I acquired my lot in 1985 and built the cottage on the other side of my property in 1986. The Boathouse was designed and started to build in summer of 89' completed for use in 1990. The Loons call, the trains whistle and the star gazing from the deck is unsurpassed. Cast a line off the deck or swim off the dock it is a wonderful place to stay. I can't guarantee the weather, but everything else will be a great time to spend in Muskoka. It is close to many world class Golf courses. there in the classic boat museum in Gravenhurst. The opera house in Gravenhurst and the shopping in Bala and Port Carling. one 4 piece bathroom with great water pressure. Huge 360 degree deck approx. 1300 sq. ft. either sun all day or sit in the shadows your call. Spent a week up during end of August and it was an absolute pleasure. Very relaxing and private area close to Bala and Gravenhurst. Definitely will re-book in 2019. My family and I really enjoyed our stay at this wonderful haven on the lake. If you are looking for a peaceful, clean and cozy place to stay on Lake Muskoka, this place is a find. We stayed for a week and enjoyed the sunrises and sunsets on the deck and slept to the gentle sounds of the lake outside our windows. The cottage was clean and private with amazing views of the lake. The host was more than helpful with any of our needs allowing us to use his kayaks and paddle board on the lake and we would definitely come back and stay again! My husband and I rented Steve’s boathouse for a week in August. It is every bit as serene as it appears in the VRBO posting. The deck offers a breathtaking view of Lake Muskoka, and features the sunrise and sunset perfectly. It is also ideal for stargazing, train watching, and sunbathing. We could hardly pry ourselves off the deck to run into Bala for supplies. 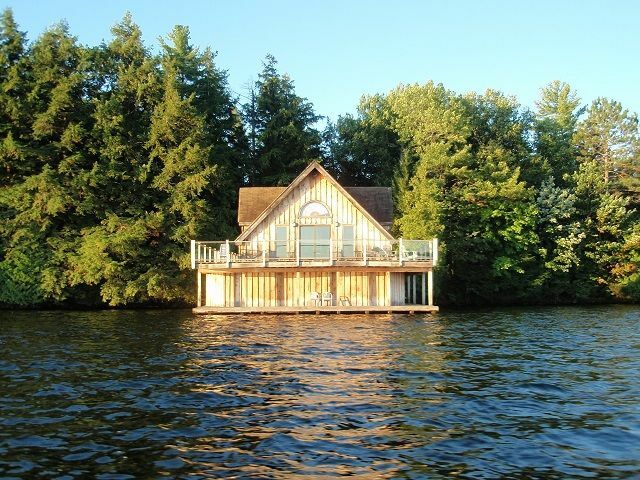 The Boathouse is quiet and private, but only a short drive into Bala and Port Carling. It was the best week of my year to date. The unit is well maintained and had every amenity we needed. The owner, Steve Manchee, was a dream to deal with. He went above and beyond to ensure we enjoyed our stay. We had the most wonderful time, and cannot wait to go back next year. Sittin' on the dock of the (Bala) bay! Quiet & Escape from reality! My wife and I both work in highly demanding stressful careers and we enjoy our time AWAY from everything. Steve's Boathouse sure delivered that! You have a wide open view of Bala Bay and are across the lake from the train bridge which provided many glimpses at the MacTier northern route with trains throughout the day and night. The inside is maintained immaculate and the outdoors has a weathered feel like many traditional Muskoka type cottages. I always enjoyed sailing the lakes on the Segwun as a child and wanted to one day be relaxing on one of those cool boathouse properties, this was my realization come true. The price is steep, but you do get what you pay for. The amenities of home including well maintained inside and comfortable beds, and a million dollar view. We relaxed on the lower deck fishing & swimming, but spent the majority of our time on the upper deck just taking it all in. We experienced a loon, cormorants, odd seagull, heron flying by daily, and curious red squirrels running about. We were grateful to be on the water with a slight breeze that kept the mosquitoes at bay, as they are bad this year especially in the woods and likely most cottage settings. Steve was great to deal with and it was a hassle free rental for both of us. We hope to bring my elderly parents back again next year, and enjoy more time if we can! Beautiful Boathouse; compact & efficient kitchen, lots of room, comfortable beds, well maintained, views of sunrise and sunset, private, great breeze off the lake, huge deck, great swimming off the lower dock with a ladder, 2 story windows to the lake with spectacular view…our favourite place! 2 private bedrooms with queen size beds & an upper loft with a double bed. We visit here at least once a year, highly recommended for spring, summer and fall! Small & quaint village of Bala nearby, for shopping, banking, ice cream, dinners & amazing concerts at the Key to Bala, but that's only if you can tear yourself away from the boathouse! There are many things to do if you are not just chilling on the deck. The steam boat rides in Gravenhurst or visiting the golf courses in the area. Many many things too many to list. Water ski show every Tuesday evening in Bala. Visit the Cranberry Marsh. Shopping in Port Carling a short drive from the cottage. The water ski school also a short drive . The Kee to Bala on Sat. nights, great bands and dancing.